Located on the ground floor. The room has its own bathroom, garden terrace and a side view of the beach. Superior room Roky can accommodate 3 people. Located on the ground floor. The room has its own bathroom, garden terrace and a side view of the beach. Superior room Katya can accommodate 2 people. Located on the ground floor, with a beautiful view of the beach. Equipped with a large, covered terrace. Master Room Juliyan can accommodate 3 people. The lower part or the ground floor can be rented in its entirety. It covers both Superior rooms (Roky and Katya) and Master Room Juliyan. Ground floor accommodates 9 people. Master room Valentina is on the first floor of Beach Villa Lanka. It has a private bathroom and large covered terrace with spectacular views of the Gulf of the exotic Indian Ocean. It can accommodate 3 people. The suite is located on the first floor and consists of 2 Superior rooms with 2 bathrooms and a summer kitchen on the terrace . It has a view of the bay. Rooms are interconnected and can accommodate 5 people. 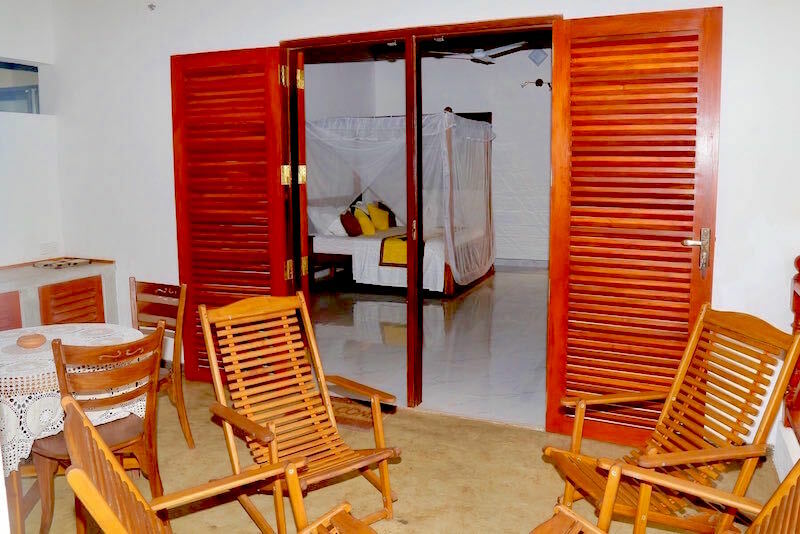 The upper floor of the Beach Villa Lanka can be rented in its entirety. It includes the Master room Valentina and family Suite/Apartment Vila. Together, it can comfortably accommodate 7 people. Rent the entire villa for a period of time that suits you best. It includes 2 Superior rooms (Roky, Katya), 2 Master rooms (Juliyan, Valentina) and the family suite Vila. It can accommodate 14 persons.